While I was in Sweden this fall, I had a session with the incredible Danielle Beinstein, an astrologer I discovered through the also incredible Lacy Phillips of Free & Native. As we started our session, I told her a bit about where I was at. Feeling this deep yearning for a home, and also feeling totally unsure about where that might be - feeling the lack of it. That was no surprise, she told me. Saturn (that planet of hard-fought lessons) had just entered my fourth house - the house of home. She asked me about what had been happening in my life 28 years ago, because likely those same themes and patterns were going to be coming up, because they needed to be healed. That takes us back to the time my parents were first separating, when my idea of home was completely disrupted. My brother and I started shuttling back and forth between our parents, figuring out what this all meant for our lives. I entered a state of transience. One memory stands out: my dad was living in a one-bedroom near Main and Broadway in Vancouver (way back when, before the adorable coffee shops started cropping up, when it was still a sort-of run down part of town). My brother and I would stay over a couple of times a week. Because it was a one bedroom, we'd spend the night on either side of his bed, each with our own foam mattress. I hated it. Having my own space has always been enormously important to me (or maybe this is when that crystallized, really, and now it feels like always). I remember deciding that the front hall - which was set apart from the rest of the apartment, around a corner - could be a perfectly adequate bedroom. I decided to stake my claim, moving my bed and setting up a drawing of a television. My own space. It didn't last, of course, but just the doing - the yearning - was incredibly important. I needed to know that I had something that was mine. And now let's return to last November, 28-ish years later. Here I was, having packed up and set off to spend an undetermined amount of time in Europe, living in a friend's spare room. I felt both free and glad and totally untethered - living in someone else's space, out of a backpack. And now I'm back in Toronto, and that same feeling has stayed with me. I've hit 7+ years in Toronto, and am going through that 7-year-itch of thinking about where I might be next. Not feeling like I'm fully home, and wanting to find it so badly. And today, sitting outside and staring up at the winter light filtering down through the trees and snow (that same Ontario light you see in all of the Group of Seven winter landscapes), I realized: I create my home. A lot of the work I've done in therapy comes down to the same thing: I am a grown-up now. I have agency, and power, and I can make choices and act from my own sense of self, instead of letting the world around me decide what it thinks is best. And so, while I'm still feeling that call to find a place where I feel totally at home, I'm also getting to work with creating the home that I want for myself. I came inside and immediately started tidying. Started thinking about what I can do to make this apartment I both love and want an upgrade from (Toronto rent being what it is, I live in a very cute basement apartment. While very cute, it is also a basement, and this aquarian wants so much light and air, and a view.) my home. I found and lit the candle that always makes me feel relaxed and glad in the winter (Thymes Frasier Fir - I stock up at Chapters every December). 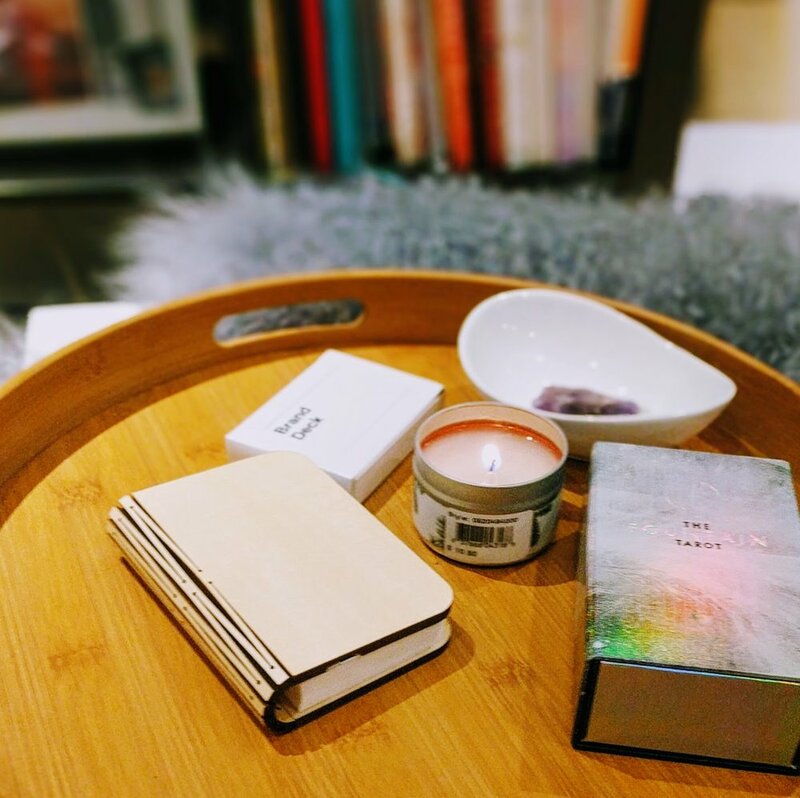 I bundled together my favourite objects and put them on a tray on the coffee table, after carting away the piles of papers that had built up. I thought about what I need to make this space as mine, as homey, as possible. What home looks like for me, in this moment. Favourite magical things, with lots of books in the background. Because I don't need to stay in that constant state of waiting. Yes, I may discover a place that feels like home, and I may move, but while I still want those things, I have power here. I can create home, too. So that's part of the work I'm doing now. Exploring that. Coming back to that. The idea that I am home. That it's okay to want, and it's okay to relax. I don't need to keep waiting. I can settle in.